"To fight evil, you've got to taste it." 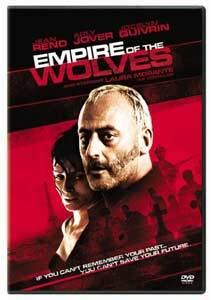 There is a weird daisychain of connections surrounding the convoluted Euro-action thriller Empire of the Wolves (L'Empire des loups) that would almost seem to guarantee it would have some merit. It may be confusing, but try to follow along with me. Wolves director Chris Nahon helmed Jet Li's Kiss of the Dragon in 2001, operating under a screenplay from Luc Besson, the director of Léon and The Fifth Element. Nahon's film was produced by Patrice Ledoux, who also did the same for Léon. Jean Reno, the droopy-eyed action star of Léon, stars in Wolves, with a screenplay based on a novel by author Jean-Christophe Grangé, who also wrote the violent thriller Crimson Rivers, which also starred Reno. So let's recap: for Empire of the Wolves we're left with Nahon directing Reno in another violent, conspiratorial Grangé story, who also wrote the sloppy sequel Crimson Rivers: Angels of the Apocalypse, along with Luc Besson, whose producer for Léon (Patrice Ledoux) is part of this project. My hopes that Empire of the Wolves would be in the vein of the outstanding Crimson Rivers—what with the underlying Grangé/Reno connection—were basically dashed less than halfway through Nahon's overlong exercise in who-gives-a-crap-what-happens, at which point it simply became an endurance test to see if I could either make it to the end or have some iota of an inkling of what was going on. Things start off promising enough, with a pair of seemingly unrelated storylines that eventually overlap, with one concerning the strange memory problems of Anna Heyme (Arly Jover) and the other an investigation into a series of brutal mutilation murders of illegal Turkish immigrants. Paul Nerteaux (Jocelyn Quivrin) is the young investigator who decides to lure bad apple detective Jean-Louis Schiffer (Reno) out of retirement to help, since his area of expertise was the Turkish underground. It's one part buddy picture, or so it seems, with the mismatched pair struggling to work together, with Shiffer's violent and bloody interrogation methods that include cutting off a man's fingers to get information. The investigation into the mutilation murders dregs up some mysterious right-wing Turkish political group known as the Gray Wolves, and that's pretty much where things fall off the track. I've always considered Reno to be one of those very watchable actors, but lately his roles have been redundancies of former glories, and here he revisits the craggy loner persona, but unfortunately it's one I cared little for. The lost memory storyline with Jover finally crosses over, but by that time I was scratching my head, wondering why I was even attempting to figure out what was going on. The action sequences and shootouts are nothing spectacular, but they are frequent, and the DVD benefits from a deep, booming 5.1 surround track that glosses over the need for a plot I could neither follow nor care about. At about the halfway point I decided things could quite possibly come together at the end (sadly they don't), and of course I should have been somewhat the wiser having muddled through Grangé's novel The Stone Council, a labyrinthian thriller that left the same slightly confused "who cares" taste in my mouth. Oddly enough, The Stone Council is being made into a feature film with Monica Bellucci, and I can only hope things make more sense there than they did in the book. But at least it will have Monica Bellucci. Image Transfer Review: Content be damned, the 2.35:1 anamorphic widescreen image transfer is terrific. The overall palette is very metallic, an intentional piece of cold blue color correction that gives nearly every scene a very harsh, almost clinical feel. The level of image detail is quite strong, with solid black levels throughout, and aside from a few minor compression issues here and there the transfer is a beaut. Audio Transfer Review: I suggest bypassing the anemic 2.0 surround English dub and heading straight for the original 5.1 Dolby Digital Surround French language track. For an action/thriller, the surround channels get put to good use, with the score and ricocheting bullets, and the bottom end gets handled with some deep, explosive rumbles. It's a pretty aggressive presentation all the way around, and small effects, such as dripping water, get pushed to the left and right fronts to really broaden the soundstage. It's a shame the movie wasn't half as good as the sound mix. Extras Review: The supplements consist of a nothing but a set of seven assorted trailers. The disc is cut into 28 chapters, with optional English subtitles. Nearly as confusing as it is long, this disappointing mess of a Euro-thriller goes nowhere fast, and takes its own sweet time getting there. I generally consider Jean Reno one of those actors that can make anything endurable, but that theorem really gets put to the test here.